Every year the National Committee on Pay Equity (NCPE) publicizes “Equal Pay Day” to bring public attention to the gender earnings gap. According to the NCPE, “Equal Pay Day” fell this year on April 10, and allegedly represents how far into 2018 women will have to continue working to earn the same income that the men earned in 2017, supposedly for doing the same job. 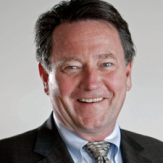 Inspired by Equal Pay Day, I introduced “Equal Occupational Fatality Day” in 2010 to bring public attention to the huge gender disparity in work-related deaths every year in the United States. 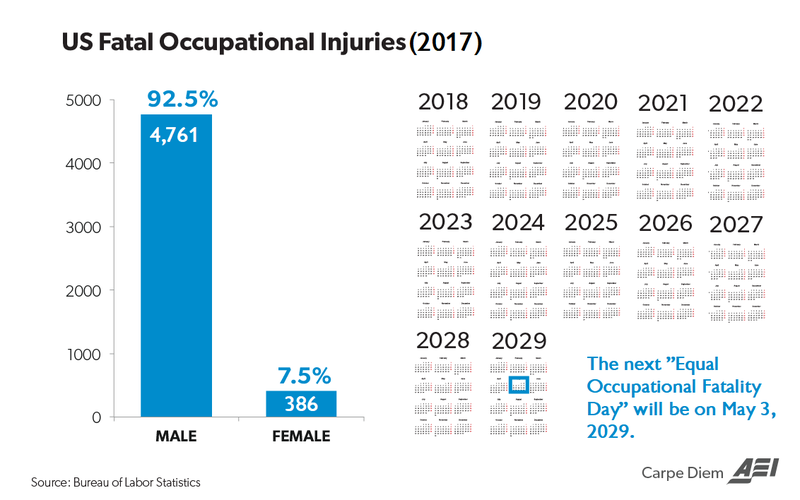 “Equal Occupational Fatality Day” tells us how many years into the future women will be able to continue to work before they will experience the same number of occupational fatalities that occurred for men in the previous year. The Bureau of Labor Statistics (BLS) released data this week on workplace fatalities for 2017, and a new “Equal Occupational Fatality Day” can now be calculated. As in previous years, the graphic above shows the significant gender disparity in workplace fatalities in 2017: 4,761 men died on the job (92.5% of the total) compared to only 386 women (7.5% of the total). The “gender occupational fatality gap” in 2017 was again considerable — more than 12 men died on the job last year for every woman who died while working. Based on the BLS data for 2017, the next “Equal Occupational Fatality Day” will occur more than 10 years from now ­­– on May 3, 2029. That date symbolizes how far into the future women will be able to continue working before they experience the same loss of life that men experienced in 2017 from work-related deaths. Because women tend to work in safer occupations than men on average, they have the advantage of being able to work for more than a decade longer than men before they experience the same number of male occupational fatalities in a single year. Economic theory tells us that the “gender occupational fatality gap” explains part of the “gender earnings gap” because a disproportionate number of men work in higher-risk, but higher-paid occupations like commercial fishing (99.9% male), logging (98% male), pilots (94.0%), and roofers (99.4% male); see 2017 BLS data here. 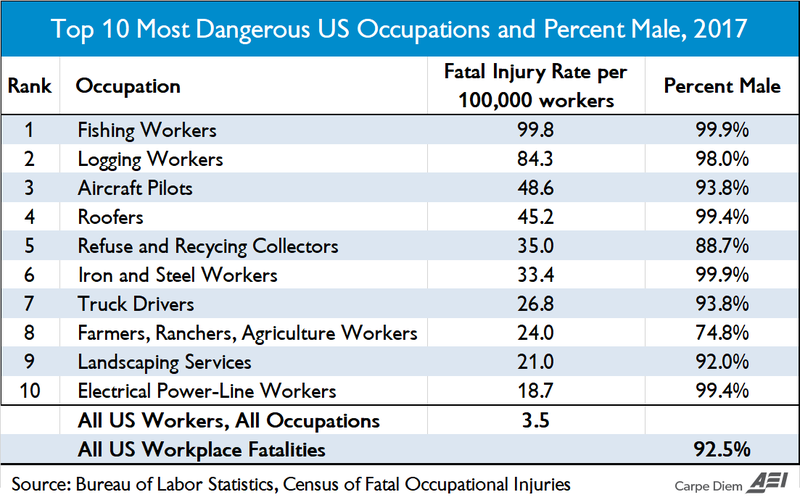 The table above shows that for the ten most dangerous US occupations based on fatality rates per 100,000 workers occupation in 2017 men represented more than 90% of the workers in eight of those ten occupations, and more than 88% of the workers in nine of the ten occupations (see Chart 3 here). On the other hand, women far outnumber men in relatively low-risk industries, often with lower pay to partially compensate for the safer, more comfortable indoor office environments in occupations like office and administrative support (72.2% female), education, training, and library occupations (73.0% female), and healthcare (75.0% female). The higher concentrations of men in riskier occupations with greater occurrences of workplace injuries and fatalities suggest that more men than women are willing to expose themselves to work-related injury or death in exchange for higher wages. In contrast, women, more than men, prefer lower risk occupations with greater workplace safety, and are frequently willing to accept lower wages for the reduced probability of work-related injury or death. The reality is that men and women demonstrate clear gender differences when they voluntarily select the careers, occupations, and industries that suit them best, and those voluntary choices contribute to differences in pay that have nothing to do with gender discrimination. 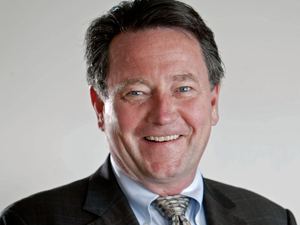 Bottom Line: Groups like the NCPE use “Equal Pay Day” to promote a goal of perfect gender pay equity, probably not realizing that they are simultaneously advocating an increase in the number of women working in higher-paying, but higher-risk jobs like logging, roofing, iron and steel work, and electric power line work. The reality is that a reduction in the gender pay gap would come at a huge cost: several thousand more women will be killed each year working in dangerous occupations as occupational fatalities by gender are equalized. This study leads to the unambiguous conclusion that the differences in the compensation of men and women are the result of a multitude of factors and that the raw wage gap should not be used as the basis to justify corrective action. Indeed, there may be nothing to correct. The differences in raw wages may be almost entirely the result of the individual choices being made by both male and female workers. Conclusion: I hereby suggest, that after adjusting for all factors that contribute to gender differences, Equal Pay Day actually occurred maybe the first week of January…. but NOT the second week of April. Women especially should be embarrassed by the statistical falsehood that is annually promoted by NCPE’s Equal Pay Day that suggests that gender discrimination in the labor market burdens them with 13.5 additional weeks of work to earn the same as their male counterparts – when that’s not even remotely true. Finally, here’s a question I pose for the NCPE every year: Closing the “gender earnings gap” can really only be achieved by closing the “occupational fatality gap” to achieve “occupational death parity.” Would achieving the goal of perfect pay equity really be worth the loss of life for thousands of additional women each year who would die in work-related accidents? Every year the National Committee on Pay Equity publicizes “Equal Pay Day” because calling it “More For Women Day”, although accurate, just doesn’t generate the same sort of feelz. Homicide accounts for nearly 20% of women’s deaths in the workplace. how many killed by other women? I see another Venn diagram here. No. The rising far left wants to take from earnings of those doing dangerous jobs, and redistribute to those who identify as women. In addition to homicides as female mortality cause, auto accidents on the job account for many of the rest (I don’t have numbers). This isn’t a measure to influnce an equal statistic by putting more women in equal harm jobs, it’s to make an equal statistic by way of paying women more than men at non-life threatening jobs to overpower the lack of women in dangerous work assignments. There will hardly be an up-tic in women/job fatalities by means of creating equal pay. Or landscaping for that matter. All this points to the absurdity of making any of these calculations in the first place, an absurdity I assume Mark agrees with. An interesting comparison (to me, at least, as my son-in-law is a pilot) is that airline pilots die at nearly twice the rate of truck drivers. But how many times have you heard that flying is safer than driving? Of course both are true, because while a 1000 mile flight is safer than a 1000 mile drive, a 2 hour 1000 mile flight is much more dangerous than a 2 hour 100 mile drive. So the consumer compares the 1000 mile flight to the 1000 mile drive, but a pilot/truck driver compares the 2 hour flight to the 2 hour drive. How to lie with statistics, for sure, which is why any study of stuff like this should be taken with a grain of salt.